‘Through the irregularity of our postal communications with Europe, consequent upon the repeated failures of the Australian R. M. S. N. Company, a file of the Gardeners’ Chronicle for part of December and January, 1852 and 53, has only just been received. I have interested myself in a discussion which I find in them relative to the occasional imperfect colouring of black Grapes. In a concluding paragraph of a Leading Article upon the subject, in the Chronicle of the 1st of January, the writer expresses a desire for information, whether this accident be known in warmer climates, such as the Vine districts of France and Spain. Perhaps, although late to mingle in the controversy, a few antipodean memoranda may not come amiss towards a right appreciation of the question; and as I have paid considerable attention, during more than 30 years, to Vine culture in this climate (which is extremely favourable to the perfect ripening of the Grape), having in that period planted, and up to the present time managed, more than 25 acres of Vines, I will offer no further apology for sending you the following observations. The Black Hamburgh, though not extensively cultivated for wine, owing to its deficiency in sugar, is a favourite eating Grape, and next to the Chasselas preferred by us for the table. We grow it in considerable quantity in a garden, trained to vertical trellises about 5 feet high, with provision, by means of temporary supports of the Indian Reed [Bamboo, today usually used in reference to Ochlandra ebracteata Raiz. & Chatterji but probably used generically by Macarthur], for the extension laterally and upwards, at various angles of inclination, of the young shoots as they grow; the object being to afford the greatest quantity of light and air to as much foliage as the space devoted to each Vine will admit of, and to shelter the fruit from the direct action of the sun’s rays. I probably need not explain that there is no deficiency of atmospheric heat, the Grapes being perfectly ripe throughout the month of March, or two months at least before the first approach of winter. It is not the practice to stop the young shoots until they have reached the full length of the supports, or to thin out either these or the laterals, further than to admit light and air sufficient to maintain a healthy colour in the under leaves down to the base of the shoots. Gourmands or water-shoots, and those which sometimes spring in clusters from the old wood, are of course rubbed off as they appear. Although it is the rule to have the Black Hamburgh, and all the black Grapes, perfectly coloured for some time previously to their being quite ripe, we occasionally see instances to the contrary; but never under garden culture, excepting in such cases of deficient nourishment as these: 1st, when the Vine is over-cropped through injudicious pruning and general treatment, or starved through the occurrence of long-continued dry weather, at the critical period between the stoning of the fruit and its first swelling off to maturity; 2nd, when, upon a particular branch, injury has been caused to the bark by accidental fracture, the gnawing of some insect, such as the grasshopper, or by the sun during an intolerably hot day; or 3rd, when either of the last two causes have operated upon the stalk of individual bunches. In the garden, so entirely do we consider the imperfect colour of the fruit a symptom that the Vine is over-cropped, that it is immediately relieved of the greater portion of the bunches, and at the winter’s pruning cut back very short, besides having a good dressing of suitable manure applied at root. I cannot recollect in garden culture an instance of badly coloured Grapes upon Vines in vigorous health (that is, properly furnished with healthy well-developed leaves), however screened by that foliage the fruit might have been. Not to make myself imperfectly understood, I mean, so long as air and light enough be admitted to keep the leaves down to the bases of the shoots in healthy condition. In a vineyard, where it is the practice to encourage the production of the fruit much nearer to the ground, I have witnessed the imperfect colouring of the Grapes from a different cause. The variety affected was the Black Hermitage (the “Scyras” or “Syrah” of the celebrated vineyard of that name on the Rhône), which has a very rambling, rampant habit for a wine Grape. The Vines in question were growing in a low, rich spot, where the soil is both deep and porous; and there were probably three times as many plants to a given area as the nature of the soil and the particular variety rendered advisable. Owing to the sudden abstraction of labour attending our gold crisis the Vines, which had been pruned to the height of about 18 inches from the ground, and attached to stakes 4 to 5 feet high, had been allowed to continue their summer’s growth unchecked and untouched. They grew so much that, from the tops of the stakes, their shoots were completely interlaced with those of the adjoining Vines, so as to render the rows quite undistinguishable through the canopy of luxuriant foliage. Long before the vintage the under leaves had become sickly and yellow, from the exclusion of light and air. At the usual period of maturity the crop, which was sufficiently abundant, remained in very imperfect condition. The Grapes were sweet to the taste, but deficient in sugar, and so badly coloured that only the more exposed portions of the bunches and berries had a purple tinge; the less exposed, though swelled off to the usual size, and with other indications of maturity, retained a greenish colour, more or less splashed with red. After being allowed to hang upon the Vines much beyond the usual time without sensible improvement, the crop was gathered to save it from rotting. I may observe that the season had not been unfavourable, and that the same variety hard by, but much less closely planted, had ripened its fruit perfectly, with the ordinary fine colour and bloom. Where the Grapes were badly coloured, the accumulation of succulent growth, with largely developed leaves, had maintained the surface of the ground and the surrounding atmosphere in a damp, unwholesome condition. It is of course impracticable to distinguish the mischief produced by the exclusion of light simply, from that caused by a stagnated, damp atmosphere; because the two conditions are scarcely to be separated in out-of-door cultivation. I do not consider the state of the soil to have been unfavourable; it never remains wet after any quantity of rain, being so thoroughly drained in consequence of its great depth and porous character. Having stated the facts, I leave the conclusions to be drawn by authorities more competent than I am. Here are a few more facts indirectly connected with the question. An extremely hot day occurring about mid-summer, the heat reflected from the ground, or a current of hot air, affected about 2 acres of vineyard in a remarkable manner. The under leaves, which were perfectly screened from the direct action of the sun, appeared to have their circulation suddenly arrested. They were not scorched, but, as well as the under growth of young wood, soon began to assume a premature autumnal appearance, and the former to fall off. By the end of four or five weeks, or before the Grapes were more than half ripe, the bunches were-left hanging quite bare and exposed to view, but still well sheltered from the direct action of a nearly vertical sun, by the abundant foliage, which continued in perfect health upon the young shoots, upon probably three-fourths of their length, leaving enough apparently for the healthy circulation of the plants. The Grapes seemed to ripen more slowly than usual, but became perfectly well coloured, and fine to the eye. At the vintage, however, their must, tested with the saccharometer, proved to be less dense than usual by l5° to l8°; or, to express differently, there was a deficiency of about half a pound of sugar to the gallon of must. 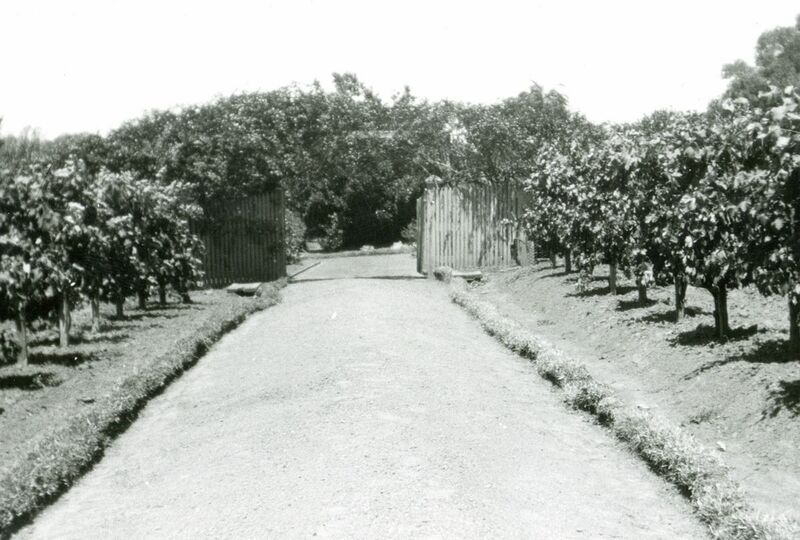 From another portion of vineyard, occupied by the same varieties, which did not at all suffer from the excessive heat, the crop was gathered at the same time, the must proving to be rather richer in sugar than usual. There was nothing in the appearance of the Grapes upon the injured Vines to lend one to suspect such a difference. The season had been very favourable, and the period of gathering had been postponed to a later day than usual. I may mention, likewise, that even the injured Vines continued to make fresh growth for several weeks after the accident to their foliage, but not to any considerable extent; and that there was nothing unusual in their state; except that their lower leaves and the corresponding wood appeared to have ripened six or seven weeks earlier than usual. The foregoing circumstances would seem to indicate that the leaves which are situated in immediate relation to the bunches of fruit, exercise an important influence upon their richness in sugar, but that, other circumstances being favourable, the latter will become perfectly well coloured, although the lower leaves should be wholly removed. Here are a few more memoranda relative to Vine culture, the result of our observations. The fruit of young Vines is never to be compared in quality to that from plants of mature age, which are well tended. It may be as fine, perhaps finer to the eye, but it is relatively coarse and thick skinned, and deficient in the high aromatic flavour which characterises the produce of healthy older Vines. Until Vines attain the age of seven or eight years, I do not think their fruit is in perfection, if even then. In vineyard culture, we are satisfied that the quality of the wine sensibly improves as the Vines acquire age. The wine of the same year from Vines 20 years old is better than that produced by the same sorts, in the same soil, of only 10 or 12 years’ growth. I have no doubt of this fact, in our vineyard at least. We do not esteem Grapes for the table after they have attained the maturity desirable for wine; they are then scarcely wholesome, their juices becoming too viscous and sugary to be easily digested. The varieties most rich in sugar, out of several hundreds which at various times have been introduced from Europe, are the Verdelho, from Madeira, the different varieties of the Pineau, or Burgundy, and the Frontignans. Few of the others approach these in sugariness. A Grape may be very sweet to the palate, and yet contain very little sugar, witness the Chasselas; the converse also is frequently observed, a sort rich in sugar which does not impress its sweetness in any very sensible degree upon the palate. We consider the must to be too poor in sugar even for the lighter descriptions of wine, when its specific gravity does not exceed 1.085 or 1.086. The greater part of our dry wines are made from must ranging from this point to 1.110 or 1.112 They are considerably stronger than the majority of the French wines, and appear to be capable of being kept with advantage for a number of years. When the must attains still greater sweetness, it requires the fermentation to be carefully managed to insure the attenuation of the whole of the sugar; and when a much higher degree of ripeness is reached, which is sometimes managed by keeping such Grapes as the Frontignans to dry upon hurdles, in the shade, for several weeks after they have acquired the greatest maturity upon the Vines the season seems to admit of, a very rich, strong-bodied sweet wine is the result - less sweet but more spirituous than the boiled wines of Lunel and Frontignan and much less sweet than Constantia, with more of the character of Malaga, perhaps, but with a perfume and flavour peculiar to itself. We have no means of ascertaining correctly the density of its must, the scale of the saccharometer we use not extending sufficiently, but it is probably from 1140° to 1l50l°. W. McArthur, Camden, N. S. Wales.’ [GC April 15th, p.238/1854]. This photograph, taken in the 1930s, shows part of the now defunct Lower Garden. The trees lining the path are persimmons. This, the original garden at Camden Park, was 5 acres in extent and both a pleasure garden and productive, producing fruit and vegetables. The Black Hamburgh grape, described as grown 'in considerable quantity in a garden', was certainly planted here. I am indebted to Len English for this photograph.